The 2014 season at the National Theatre could arguably be renamed “Unhappy Families, A Study On Parents And Daughters”. Whilst the Lear dynasty rages at each other in the Olivier, a far more recognisable family of modern Britons has lodged in the Lyttleton. Shelagh Delaney's A Taste Of Honey is her 1958 debut that paints a bleak tale of single parenthood in Salford, Lancashire. It's a carefully crafted piece of theatre, all the more remarkable for having been penned by the 19 year-old Delaney who hailed from a working class Manchester background. In a literary era still dominated by a privileged patriarchy, that her work prevailed at all was due to the playwright’s nurturing by the remarkable Joan Littlewood. The play was first seen on the Theatre Royal stage at Stratford East and that Littlewood’s Oh What A Lovely War is currently in revival there, speaks volumes for the older woman’s theatrical energy and vision. A Taste of Honey pivots around school-aged Josephine (Jo) and her mother Helen. Kate O'Flynn is Jo, giving a career defining performance that portrays the feisty girl who has never been shown maternal love, from petulant teenager through to the brink of motherhood. O'Flynn is at once naive, worldly and coquette. When her mother is besotted with latest suitor Peter, it is Jo‘s radar that detects the man is a serial cheating womaniser. When Jo does ultimately find an unconditional love from gay friend Geoffrey, O'Flynn's handling of her affection for the young man avoids all mawkish sentimentality. Hers is a complex role and in one of the finest performances currently to be found in London, she masters Jo's challenges superbly. Lesley Sharp is Helen. Bitter and hard, more concerned with having a man in her arms than her daughter's welfare. Sharp is an expert foil to O'Flynn's teenage angst and her desperate love for her dishonest boyfriend could almost be pitiful. Delaney however is too smart to allow us any sympathy for the self-centred harridan and her final act of selfish cruelty towards her daughter is heart-breaking. The support given by Harry Hepple's gold-hearted Geoffrey to the pregnant Jo has moments of true pathos, whilst Dean Lennox Kelly makes Peter every inch the drunken manipulative spiv. Jimmie, the father of Jo's child is a black sailor, fecklessly home on shore leave. 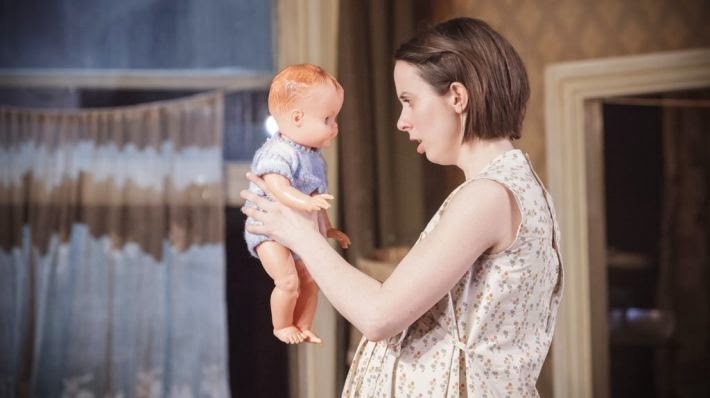 The play is famed for addressing the issue of British racism at the time with the challenges that Jo will soon face as the white mother of a black child, yet these are only hinted at during the second act and the play’s unsatisfactory conclusion tests the limits of plausibility. That’s the only flaw mind, for otherwise Delaney’s writing is spot on. Eric Kofi Abrefa could make more of Jimmie. He recently shone in the National's The Amen Corner and Kofi Abrefa has more in the tank that can lift the seaman free of the cliché he currently suggests. The back to back housing of a rain drenched industrial Manchester is cleverly evoked in Hildegard Bechtler’s design with a striking curtain image setting the scene pre-show. Our nation has moved on in 56 years. Illegitimacy is acceptable and though racism and homophobia still flourish in some quarters, much has been done to broaden the country’s attitudes towards diversity. A Taste Of Honey represents quality writing of a bygone era, with a memorable performance from O’Flynn. The NT would do well to send this one on tour, the regions deserve to see it.